We can't think of anything more French than a crusty baguette in a bicycle basket. Except a crusty baguette in a bicycle basket on the way to a Parisian picnic. We asked Tiffany Iung, of the local , where she likes to pedal and park. 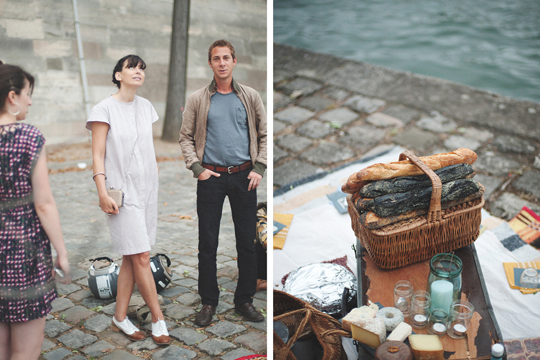 PARIS – Finding a place to enjoy a picnic is pretty easy in Paris. Whether it's an impromptu gathering with potato chips and wine from the nearest Franprix or something planned to perfection, I've mapped my favorite places in the city to unfurl a blanket. 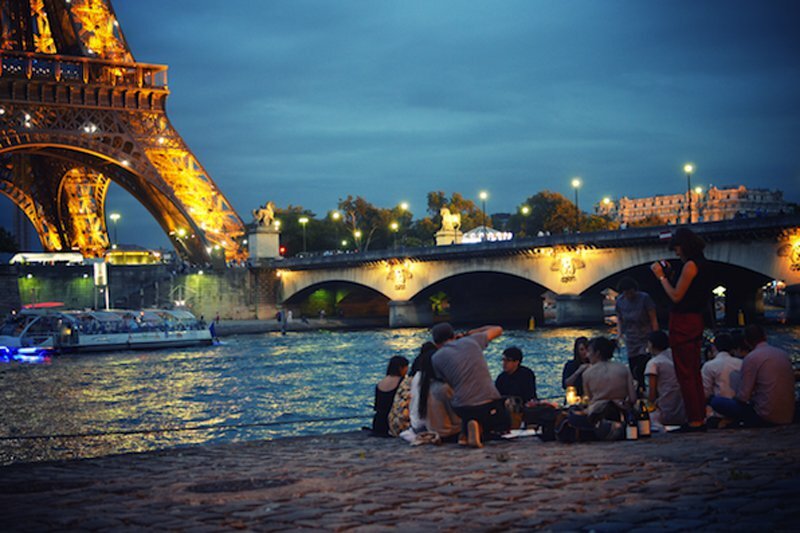 Anywhere you sit along the Seine is going to be great. I like it here because it makes me feel like I'm at the edge of Paris. There's a nice garden, and the Batomouche stops nearby. I recommend cycling through Bois de Boulogne because it is immense. You can break to rent canoes. Picture perfect. This picnic location takes a little scouting to find. 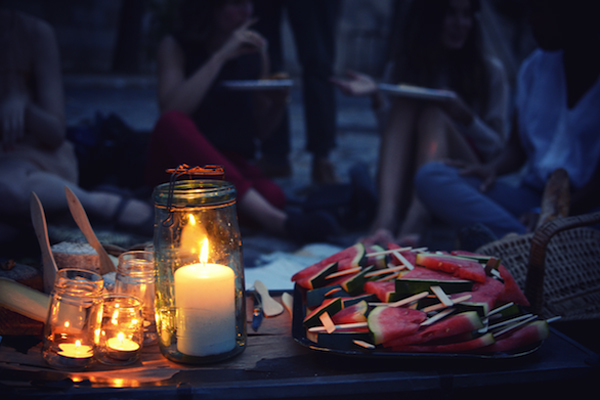 Last year I hosted a picnic for magazine with my friend Rubi. 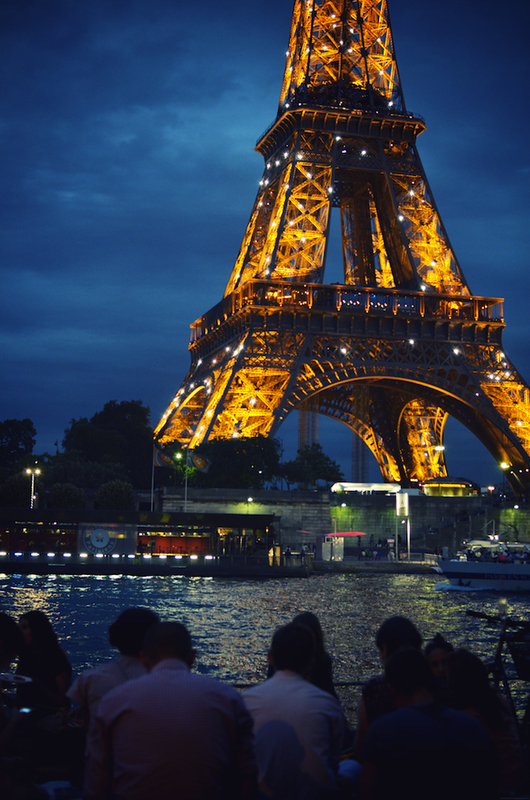 It's just opposite the Eiffel Tower, so you get quite a light show at night. Les Halles are under construction right now, so it's unpleasant to be there and difficult to find a place in this quartier with a little shade. My friend Isabelle told me about this space. When not under construction, sit on cute little benches with your sandwich when you have just a few moments to spare. The name doesn't lie. It's beautiful and a bit fussy, and there is always fantastic people watching. Rue Sainte-Anne is just next door. I recommend picking up sushi and yaki onigiri at K-Mart and coming here to enjoy it. This is where the cool kids hang out. There are a number of cafés along the canal that serve take-out beer. The park across the street is also pretty nice and has a fun playground for kids. Watermelons on a stick. Candlelight. Photo: Courtesy of . This park is the king of parks. On a sunny day, blankets are lined up close enough that you can lean over and borrow your neighbor's corkscrew. The famous bar is here too, if you feel like lining up for some Sunday night pole-dancing (I'm not kidding). It seems far, but this is really only a twenty minute bike ride along the canal. It's great for everyday picnics, but Villette Sonique in May and free outdoor movies in July and August are my favorite. Okay, so this isn't technically a picnic place. But there is a corner here where a few benches are put out in good weather. There is a Franprix grocery store for supplies. One of my favorite places to sit and watch a Sunday go by (the last time I was here, Charlize Theron ate lunch five feet away from me). It's no secret that Jardin du Luxembourg is a beautiful place. What isn't so obvious is that you can't actually SIT ON THE GRASS here. It's all benches. But there is hands-down the best playground in Paris here. A must if you have children. This church is down the street from the fashionista-famous boutique Colette. Get your shop on and then rest your heels with a snack on the steps. Guaranteed satisfying street style sightings. Tiffany is . Check out her animated video and pitch in enough to get a sandwich named in your honor. Tiffany started her Parisian sandwich delivery service in 2010 when she was looking for a way to combine her two passions: feeding people and riding her bike. She travels to get to know herself better.